We’d love your help. Let us know what’s wrong with this preview of Ego Free Leadership by Brandon Black. Take your ego out of the equation, and watch your company thrive! “I’ve got a solution,” Encore’s CFO tells Brandon, “but it’s unorthodox.” It’s 2005 and Brandon Black has just been promoted to CEO of Encore Capital, a company struggling to navigate an increasingly difficult business environment. Faced with a rapidly declining stock price and low workplace morale, Brandon knows he needs change—and fast. Following his CFO’s advice, he and his executive team start working with Learning as Leadership (LaL) and its president, Shayne Hughes. Through their partnership, Encore’s executive team learns to root out the unproductive ego habits that undermine collaboration and performance. 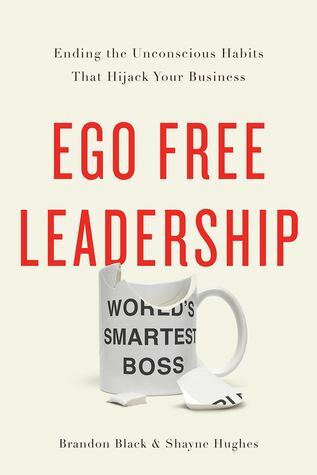 To ask other readers questions about Ego Free Leadership, please sign up. I don't normally select business books from Netgalley, but this book caught my eye and the title resonated with me for a number of reasons. As a fairly new director in a small charity (not-for-profit), I couldn't understand why there was such a huge sense of privilege and ego within the organisation, especially when the organisation was set up to serve people who are marginalised and in need of support. Through reading this book I have come to understand how the self-worth and ego of individual I don't normally select business books from Netgalley, but this book caught my eye and the title resonated with me for a number of reasons. As a fairly new director in a small charity (not-for-profit), I couldn't understand why there was such a huge sense of privilege and ego within the organisation, especially when the organisation was set up to serve people who are marginalised and in need of support. Through reading this book I have come to understand how the self-worth and ego of individual leaders can influence the ethos and working environment of an organisation, and ultimately affect performance levels and productivity. I also thought that this book would help me look at my own leadership and help me to develop my own self awareness and understand the context in which I am working. And it did. This is an excellent book for anybody who wants to develop a sense of self awareness in the business place and who wants to find ways of developing constructive communication and clarity of purpose in their work. One of the things that I believe that I should do as a leader, is to lead by example. I think the stories in this book and the case studies showing different situations and how they were addressed, are a phenomenal example of how we can improve the way we work and our work place environment by leading through example. I think for me this book is also about how we can empower ourselves and empower others to address the challenges of the 21st century workplace. The book shows that it is profitable for business leaders to become more self-aware in the workplace because they then set the example and the context for others. This then builds up trust in the workplace, strengthens team relationships and also encourages creativity and collaboration. I think this is vital for businesses, charities and other organisations because it encourages innovation. I particularly liked the section which illustrates the benefits of 'making others good' and the parts of the book that recognise that there is often more than one way of seeing things and that a certain situation can have more than one interpretation. The book illustrated this principle with a helpful diagram which I think cleverly and clearly illustrated the point in a helpful way. The book engages with the many different challenges of leadership and the need to lead people effectively, honestly and in a way that enables human flourishing. The book doesn't underplay the complexity of the issues and shows that there are no easy answers to these questions but the one thing that we do need to model is an enquiring and learning disposition. We need to be willing to be open to new ideas and find ways of listening even when we feel uncomfortable and this is a challenge. The need for active listening and reflection was also emphasised but not in an obvious way. The case studies show how vital it is to listen without being defensive and also how valuable constructive mentoring and peer to peer support can be. Another key point of learning is the need for our workplaces to be places of safety. They should be places where people feel that they can make constructive criticism and suggestions and how such a workplace can help leaders overcome our blindspots because we don't know everything and we don't see everything. There were just so many points of learning for me which I have gained from reading this book and it is a source of real wisdom and something that I can turn to for practical guidance. I think this is a valuable book and it was also very engaging and easy to read. It is written in such a way that you feel as if you're actually participating in the dialogue and in this way the book actually becomes a very valid and very valuable conversation partner. It is a must read for anyone who wants to improve their leadership, both in the workplace and in the home. Blaming, avoiding, over-controlling, assuming ill intent – in the workplace, our egos wear many masks to cover our need to be right or our fear of failure. Unsurprisingly, behaviors based on stress and anxiety often lead to politics and power struggles across the ranks and create the exact opposite of what employees want to come to work to: a culture that’s supportive, transparent, authentic collaborative, and trusting. In their book Ego Free Leadership, Brandon Black (former CEO of Encore Capital) and Shayne Hughes (president of Learning as Leadership) tell the story of their 9-year-long collaboration which completely transformed the corporate culture at Encore Capital, and consequently turned it into a highly profitable public company when many competitors in the North American debt collection industry had a tough time maneuvering through the years 2008 – 2013. However, don’t be fooled into thinking that this book is just another picture-perfect story of the American dream. It’s not, and that’s largely because Brandon Black is surprisingly upfront about the many personal ego struggles and challenges he had to overcome to create a workplace that continuously motivates people and instills a sense of pride in what they are doing. Add to that Shayne’s analyses of key dysfunctional behaviors displayed by Encore Capital’s executive team (argumentative or defensive much? ), and you begin to understand that controlling our egos is key to resolving any interpersonal conflict we experience at work or at home. Be warned though: If you are looking for a bite-size and easy-to-digest version of the latest Top 10 Do’s and Don’ts of Great Leadership, you will be disappointed. Ego Free Leadership’s 200 pages are not a quick read for most people, and you might not want to immerse yourself in someone else’s highly subjective and emotional decade-long journey when all you’re after is concise, to-the-point advice on the go. If you have to take one thing out of this book then it will be “observing the pitch and not reacting to it”. Everyone has some fears (of being misjudged, being fired, not capable, etc) and ego (to be always right, etc) based on their beliefs (not facts), which makes them to react when something unexpected happens in daily life. Instead of reacting, we should observe that pitch, show empathy, and work along. Easy read, very light and conversational. There were a few great bits but generally it felt too long for the ideas covered. I like and agree with many concepts, such as watching and studying for ego driven behaviour and being authentic, yet this is not the book I would gift to friends or colleagues. How our ego unconsciously negatively affects our perception and actions. How to find when our ego got hurt and step back to understand why to react consciously instead of in defense. How to get more personal connection and understanding through sharing own vulnerabilities. Well illustrated on thoughts, feelings and decisions made by CEO of financial corporation and comments from his coach. Another book I wasn’t so sure about before I started reading it. Again, another not just for leaders. Our ego has a way of getting in front of what we truly want, to have healthy organizations and healthy selves. With work and practice we can recognize when our ego is being pinched, changing how we react in our businesses and to our people. A must read. Loved this book! I learned how dropping the ego shield allows us to connect better with everyone around us and allows them to connect much better with us. It also helped me understand the impact of ego on how we behave, how we operate in a team and what addressing ego does to self-development, growth, being a better self and an evolved leader. While there are many positive messages in this book, it often descends into a great deal of “touchy-feely” scenarios that can put you off. From the time of the formation of the first large social structures with a decision hierarchy, there have been conflicts in both the horizontal and vertical directions. Then being humans, there will antagonism, hurt feelings and overall emotional unhappiness. These problems can be solved by being more in tune, but generally only partially. It is often the c While there are many positive messages in this book, it often descends into a great deal of “touchy-feely” scenarios that can put you off. From the time of the formation of the first large social structures with a decision hierarchy, there have been conflicts in both the horizontal and vertical directions. Then being humans, there will antagonism, hurt feelings and overall emotional unhappiness. These problems can be solved by being more in tune, but generally only partially. It is often the case that being more sensitive to someone’s feelings simply encourages them to be even more sensitive rather than the desired opposite of being a more effective worker. Therefore, it is also necessary for people to learn that a real or simply perceived slight is not automatically a cause for concern. Often the worker stewing on a slight is what causes the real loss of productivity. This book is largely a combined autobiography of the principals with an emphasis on personal feelings, behaviors and actions considered incorrect, (none of which are sexual in nature or at the level of serious name-calling), eventually leading to their story of the success of their company, Encore Capital. The company acquires the debt of people in financial difficulties and attempts to work out solutions. Despite the many good qualities of the stories, the main problem I have with the book is that it butts up against a fundamental reality. It is impossible to be an effective leader in high level positions without possessing a great deal of ego. Self-confidence is a necessity for people to be able to make decisions and risk failure. One constant of successful people is that they were willing to take the risk of failure and often did so before finally being successful. To take the position of “Ego Free Leadership” is untenable. Furthermore, without some internal conflict, organizations become complacent and are defeated in the marketplace. A good look at what happens when an organization learns to check thier ego at the door. The interactions between the coaches and Encore employees are examples of what happens when organized stretch themselves. Well worth the read. Wow - recognizing pinches that impact my reactions - priceless. This book will help you grow personally and professionally. Highly recommend! Very eye-opening book. It really made me re-evaluate my own actions and how I saw myself in the workplace. Not only the best leadership book I’ve ever read, but one of the best books, period. A must-read for any executive and company looking to take its performance to the next level. Wow, just wow. At several points in our careers, we have experienced the damaging effects of ego. This could have been your boss or co-worker affecting you or you affecting others. These individual effects cumulate to reduce the organization's potential and become part of the culture; which perpetuates more ego driven decisions. How do we stop this? "Ego Free Leadership" attempts to explain and solve this insidious problem. Brandon Black retired as the chief executive officer and director of Encore Capital Group in 2013. During his nine years as president and chief executive officer, the Company built significant cost and operational advantages, expanded into new asset classes, and made acquisitions that established Encore as the industry’s leading debt management and recovery solutions provider. In 2011, Encore star Brandon Black retired as the chief executive officer and director of Encore Capital Group in 2013. During his nine years as president and chief executive officer, the Company built significant cost and operational advantages, expanded into new asset classes, and made acquisitions that established Encore as the industry’s leading debt management and recovery solutions provider. In 2011, Encore started the Consumer Credit Research Institute, a groundbreaking effort to develop new knowledge about low- and moderate-income consumers using state-of-the-art research and fieldwork techniques. In addition, in 2013, the Great Places to Work Institute ranked Encore’s subsidiary in Gurgaon, India as the 14th best organization in the entire country. Brandon earned an MBA from the University of Richmond and a bachelor’s of business administration degree from The College of William and Mary.